Most baseball fans know the story of Roberto Clemente. The Hall of Famer played 18 years in the majors, all with the Pirates. A 12-time All-Star, Clemente also won 12 Gold Glove Awards in his career. A four-time batting champion, Clemente played on two World Series winners and was chosen World Series MVP for his efforts in the Pirates’ 1971 win over the Orioles. He was also the National League’s MVP in 1966 and drew MVP votes in 12 different seasons. While Clemente’s career on the baseball diamond was filled with tremendous highs, he is as well-known for his work off the field. Clemente was an humanitarian, championing the causes of people throughout Latin America. He passed away while performing a charity mission. On December 31, 1972, 38 years ago today, Clemente was on a plane bound for Nicaragua to deliver aid for earthquake victims. But the overloaded plane crashed and his body was never recovered. Clemente finished his career with exactly 3,000 hits. His final hit in the majors came September 30th against Jon Matlack and the Mets. 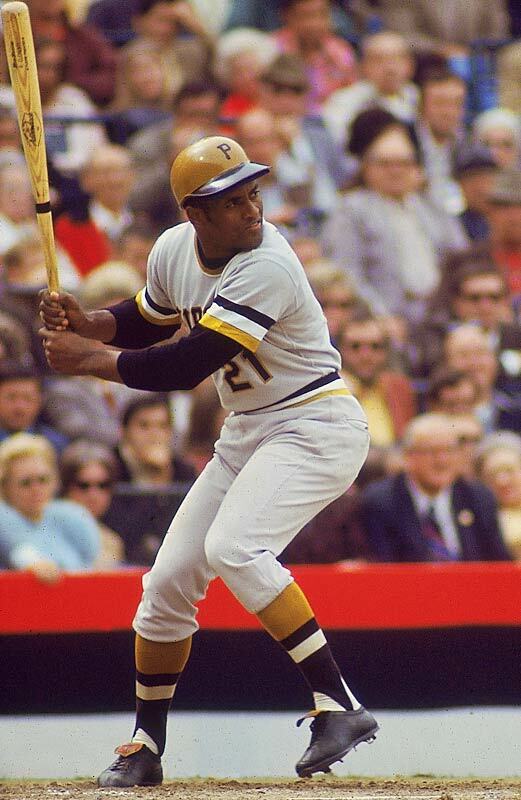 Clemente had singled in his final game against the Phillies, bringing him to 2,999 lifetime hits. The Pirates closed the season with a three-game series against the Mets and a two-game set against the Cardinals. In the opening game against the Mets, Tom Seaver pitched a two-hitter with 13 strikeouts, keeping Clemente away from the 3,000-hit plateau. Clemente thought he had recorded the milestone hit but a grounder he hit up the middle was ruled an error on Mets second baseman Ken Boswell, instead. The next night he faced the rookie Matlack, who entered the game with a 14-9 mark. Matlack struck out Clemente to end the first inning. The Mets’ lefty cruised through the first three innings but the fourth was a different story. Clemente led off the inning with a double to left center on an 0-1 curveball for his historic hit. He became just the 11th player in major league history to reach 3,000 hits. The game was halted for several minutes to celebrate the moment. The rookie Matlack, initially not realizing the significance of the hit, was upset with the delay. When play finally resumed, the Pirates put up three runs in the inning and went on to a 5-0 win. Clemente played one more inning in the field and then was removed from the game. The 38-year old played one more regular season game in 1972. In the final game of the season, he came on as a defensive replacement in the ninth inning. Clemente’s hit off Matlack was not the final one of his career, as the Pirates advanced to the NLCS and Clemente had 4 hits in 17 ABs against the Reds, who won the series in five games and advanced to the World Series against the A’s. While the 3,000th hit was the biggest tie between Clemente and the Mets, the Hall of Famer did have 11 years worth of games against the Mets. Clemente had a lifetime mark of .319/.368/.471 in 711 PA against the Mets, numbers which tracked well with his .317/.359/.475 lifetime marks. It is perhaps a bit surprising that Clemente did not put up better numbers against the expansion Mets. From 1962-1966, Clemente put up big numbers in three of those five years against New York. He had a .938 OPS in 1963, a 1.170 mark in 1965 and a .915 in 1966. But in the final six seasons of his career, Clemente was at an .805 OPS or below in five of them, including 1972 when he had a .361 mark. Only 1971, when he had a .955 mark, did he approach his earlier numbers against the Mets. While the batting conditions of the 1960s certainly held down some of Clemente’s numbers, we see only in 1968 was his sOPS+ numbers, which showed what he did against the Mets compared to what the rest of the National League accomplished, did his numbers match what he did in the early 60s. Of course, the addition of Seaver to the Mets in 1967 played a part, too. Lifetime versus Seaver, Clemente had a .242/.277/.355 line in 65 PA. But on the anniversary of his death, we should remember what a tremendous all-around player and person Clemente was. The numbers do not tell the whole story, but if you never saw him play, take a minute to look at his Baseball-Reference page to catch a glimpse of the Hall of Famer. I just watched Chasing 3000. It was an amazing movie. I grew up a Mets fan, and was 13 when Clemente hit #3000, but did not remember he hit it against the Mets. I do remember mourning his death that winter. When I heard the hit came against Jon Matlack, I got searching on the web, and found page. What a pleasant suprise. Thanks, and Happy New Year. I have not seen chasing 3,000 but will be on the lookout for it now. Another memory I have of Clemente was watching this game – http://ultimatemets.com/gamedetail.php?gameno=1476 – on 4/18/71. I was 10. Clemente had a triple for the only hit off Gary Gentry.